How to get access to iTunes backup on my PC? How to get access to iTunes backup on my PC? How to download iTunes backup to PC? How to extract data from iTunes backup to computer? I just realized a bunch of messages I had on my phone X have been deleted! I backed my iPhone to iTunes. So where would my messages be? How can I restore them? Thanks in advance! 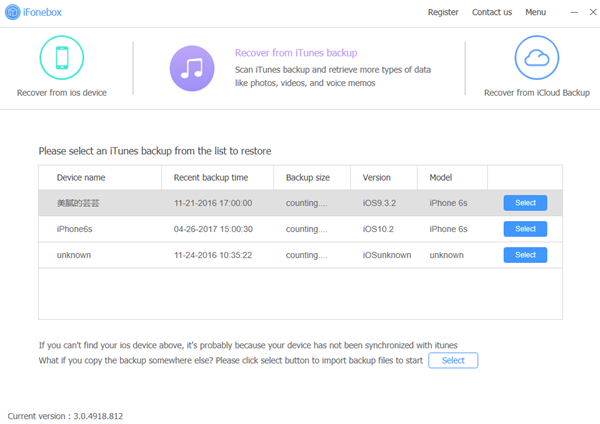 It is convenient to back up via iTunes if you are an iPhone/iPad/iPod touch user. However, keep in mind that the restore operation overwrites all the existing data on your device. And usually an iTunes backup couldn’t be completed or you can’t restore from it. 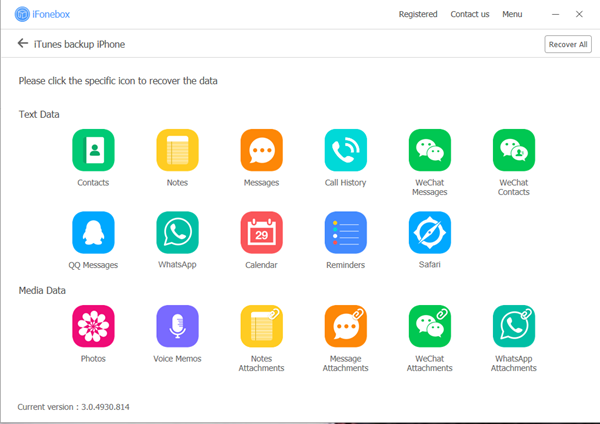 Thus users are looking for more, they are asking for the advanced options the other apps are providing, like the selective data restoration or getting a preview before the users actually restore the files. What happens when you accidentally delete your notes or other important data? Don't worry. With the help of iFonebox, you still have a chance to get them back even if you don’t have any backup. It has two available versions: Windows version and Mac version, please make sure to download and install the correct version for your computer. Then you can follow the next steps to extract data from iTunes backup to computer. Click Recover from iTunes Backup File, you’ll see all backups you have listed in the interface, choose the right backup, then click "Select" button to begin. Take messages for example, it will scan automatically after you click the “Messages” icon, it might take your some time, please wait patiently. Now you can recover the data you want from backup. Choose the items you want to restore and click the “Recover to pc”.